This side desk is a great addition to the 5' or 8' Instructor’s Lab Desk and provides a functional work surface and storage area for teachers while sitting. It is crafted from solid oak with oak and hardwood veneers with your choice of a 1" solid epoxy resin or phenolic resin top. 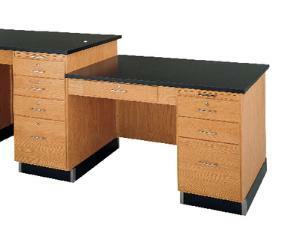 It can be attached to either the right or left side of the Instructor’s Lab Desk. The side desk features one file drawer, two storage drawers, and one pencil drawer, all of which lock. 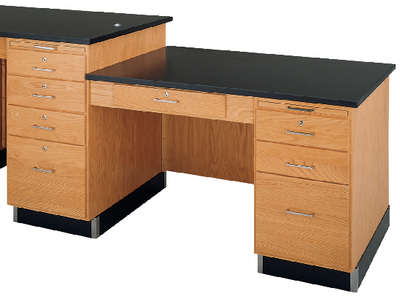 The desk also includes a 14 1/2"W x 20"D pull-out writing board. In addition, the classroom side of the desk features a bookshelf with one fixed shelf. The file drawer measures 13 7/16"W x 18 1/16"D x 10 3/16"H; the pencil drawer measures 19 7/16"W x 18 1/16"D x 2 15/16"H; and the storage drawers measure 13 7/16"W x 18 1/16"D x 3 15/16"H. Overall size: 48"W x 30"D x 30"H; weight: 300 lbs. The unit is customizable. 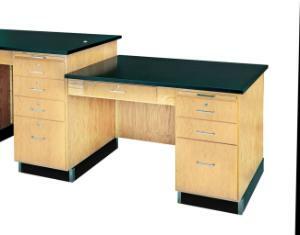 Please call to specify your choice of work surfaces, fittings, fixtures, door, and drawer configurations.